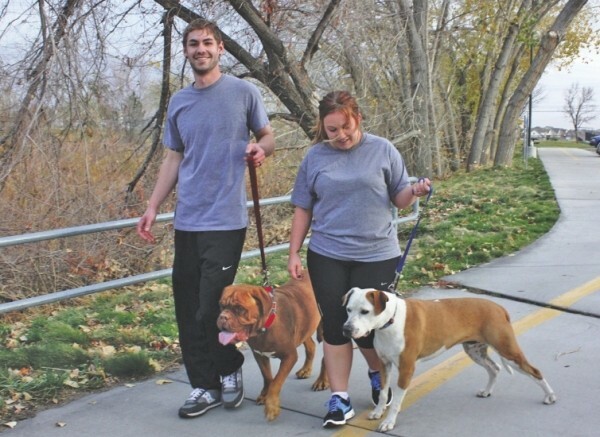 Taylor & Justine Lake walk their mastiff, Bell, and pit bull, Kingsley, along the Jordan River Parkway. The Jordan River Parkway is probably the least known of Utah’s recreational treasures—and is as much of a treasure as any of our legendary resorts. It’s a 45-mile-long trail—nearly all paved—that meanders beside the Jordan River. It runs through scenic wetlands and parks, along golf courses and under freeways, spanning an uninterrupted slice of nature from Davis to Utah counties. A relatively new section now connects to the Legacy Parkway, offering an additional 13 miles of paved trail. And there’s still more: The Legacy trail connects to the Rio Grande Western Rail Trail, which gives 18 more miles of paved trail, ending in Roy. Surprisingly, the trail is never crowded, though it offers isolation from city noise and traffic. A forest-like swath of trees border one side of the trail, with the relaxing water of the river on the other side, to be enjoyed by users who bike, run, skate, jog and walk their dogs. No motorized vehicles are allowed. Occasional dirt equestrian trails run beside the paved part for horse owners to use. Even canoes and kayaks can occasionally be seen floating along the gentle current of the river. Floaters must exit at three irrigation dams, but the porting distance for watercraft is short. A good way to handle the start and finish of the river trip is to go with a friend, park one car at the take-out point and drive back to the starting point. No engines are allowed on watercraft, a law that contributes to the peaceful ambiance of the parkway. Less than four miles of the well- maintained trail remains to be paved. With the passing of the Regional Park & Trails Bond in the recent election—which gives $47 million to the parkway—those gaps will soon be no longer. “That bond will allow us to complete 100 percent of the Jordan River Parkway from north to south,” says Martin Jensen, marketing and public- relations manager for Salt Lake County Parks Operations. “Residents can now enjoy the 45-mile trail stretching from Davis to Utah County uninterrupted.” The continuation of the parkway was an amazing act of cooperation between mayors and bureaucrats of cities and unincorporated areas that took nearly two decades to complete. One of the most city-close scenic areas is the Winchester Trailhead at 1200 W. Winchester Street, just off 6400 South. A lake offers wetland refuge for native and migrating birds. You can relax in the pavilion, which is almost always empty, and watch flocks of ducks and geese as they squawk, swim, dive for fish and take off with a loud flapping of wings. There’s also a small childrens playground, with a slide and climbing gym, as well as restrooms and a fountain. There’s now a map of this wondrous resource, and you can get a copy for free. The map of the Jordan River Parkway has the northern segment from North Salt Lake on one side, and the southern segment to Saratoga Springs on the other side. Printed on thick, glossy paper, it contains additional information about wildlife, trees and vegetation. To get the map mailed to you, call County Parks Operations at 801-483-5473, pick up a copy at the operations office (3383 S. 300 East) in South Salt Lake, or download here. While you’re there, give those people a figurative pat on the back for being part of the state’s greatest recreational wonder.